Some closeups from the collection |Sundews Etc. I don't have a macro lens. I don't even have a proper camera. 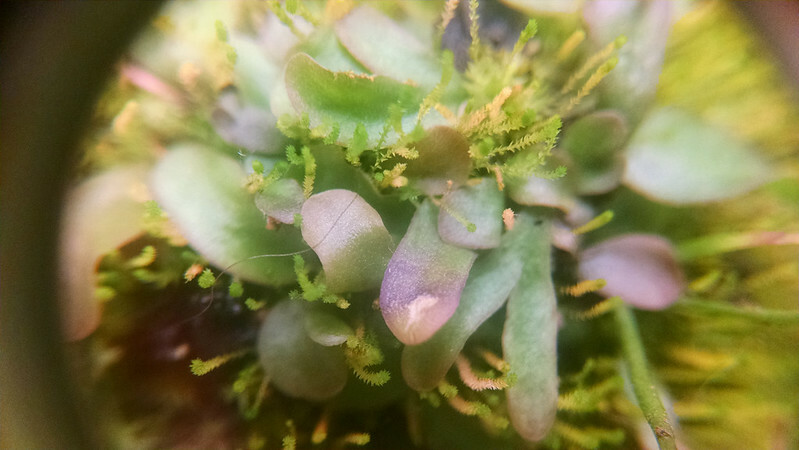 Still, I do have a 30x loupe that I sometimes use to look at my plants, and it can be used for some very makeshift closeup shots. My Drosera aliciae caught a gnat. 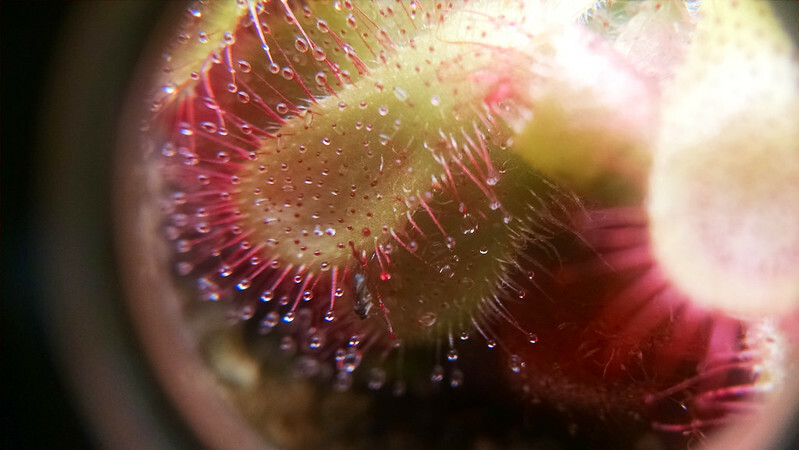 The main D. aliciae plant is still doing quite well, and enjoyed being fed (more than a single gnat) recently along with several other of my plants. Someday these will be big strong sundews. Someday. As I mentioned back on Saturday, I've sort of neglected these seedlings for a while, but I'm hoping they'll spring to life soon enough. With food, anything is possible. 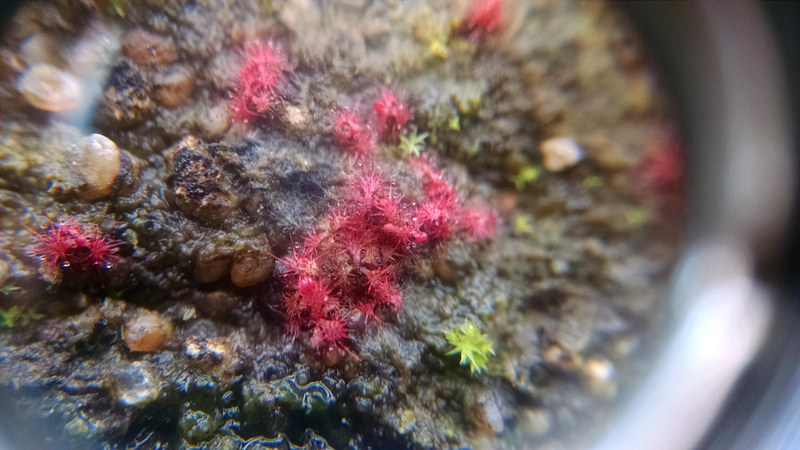 The Sphagnum I have growing in my Drosera prolifera pot is doing rather well over all. This patch is particularly plump and green and healthy. 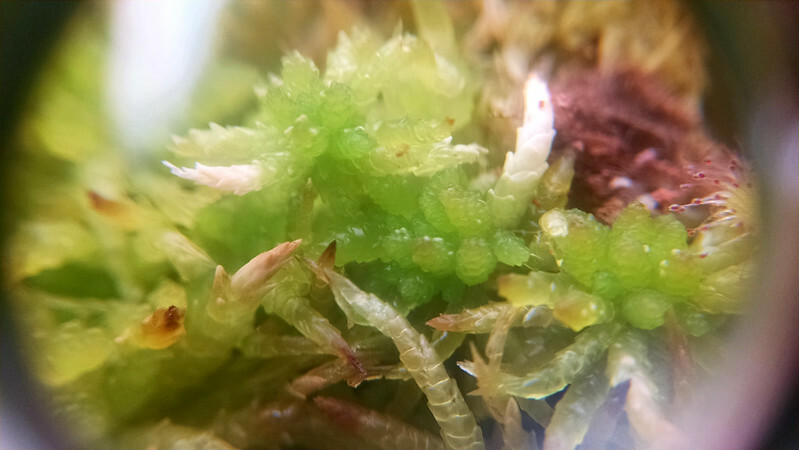 I've made my first tentative steps towards deliberately cultivating Sphagnum. I'd like to have lots of it just going so I can use it as media for some of the more delicate plants, but to get enough I'd have to start at least one tray specifically for Sphagnum culture. Incidentally, I love how this picture really shows off the tubular structure of the moss, which accounts for its superior water-holding abilities. My Utricularia praelonga is growing rather well, though the moss in the pot is a bit unruly. Not the fastest-growing Utric, but very steady. Also, while looking my plants over for good things to photograph up close, I noticed that there was a hitchhiker in the U. praelonga pot. A mystery! 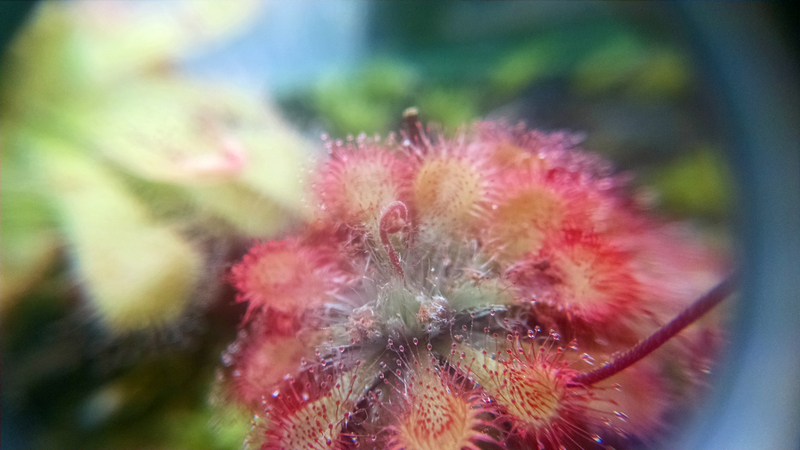 What could this sundew be? As far as I know there haven't been any sundews blooming near this pot since I've had it. I don't know where the seedling came from, but it could be anything at this point. I guess I'll just let it grow out and see what it turns out to be. 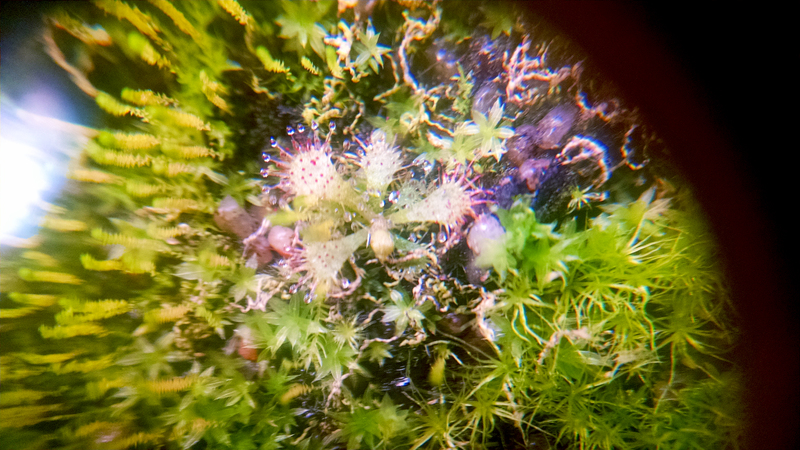 Finally, my Drosera tokaiensis has a second, tinier flower stalk. Blooming away without a care in the world. While I initially didn't pay this plant much mind, I have come to enjoy its presence in my collection, especially since it blooms so consistently and is so healthy. A plus in every collection!